BUTTONS & SCALLOPS! 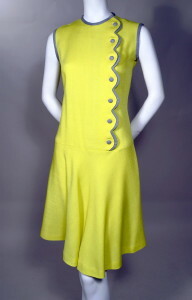 1960's vintage drop waist shift dress. Lemon yellow and gray linen weave rayon. Asymetric button and scallop closure with contrasting gray applied shadow scallop and self buttons. Slightly fitted shift bodice. Jewel neckline. Sleeveless. Contrasting gray piping at neckline & armholes. Drop waist bias-cut flared skirt. It's all about the details!! Length, measured back from neckline edge to hem edge - 38"
Excellent condition. Shows small very faint mark below left hip. Best condition, shows no wear!